Welcome to our very first sketch of June! Let's embrace a new month of creativity. Below you'll find Sketch 283. Create cards, scrapbook layouts, home decor, treat containers, mixed media, etc. using this week's sketch and be sure to link your project below for a chance at the weekly My Favorite Things Gift Voucher worth up to $20. 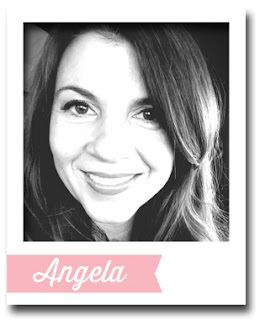 Join me in welcoming Angela Rivera as our Guest Designer this month! 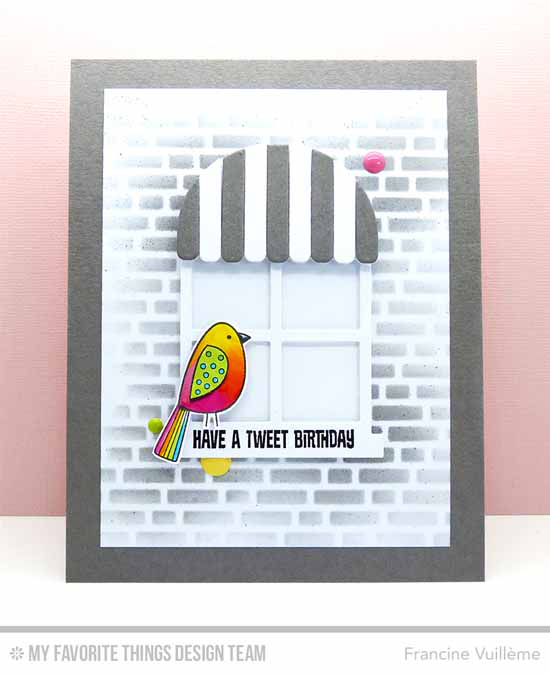 The oval of Sketch 283 is the perfect spot to showcase a bold vertical sentiment like Angela did featuring a stamp from the Birthday Sentiments set. The white on black makes a dramatic statement and her inventive and colorful watercoloring creates quite an eye-catching design! The My Favorite Things Creative Team has been busy getting creative! Let's see what they have up their sleeves for Sketch 283! Francine interprets the oval as our Boutique Window Die-namics and creates a cute scene with a brilliantly colored bird from the Tweet Friends stamp set and a lovely textured wall using the English Brick Wall stencil. 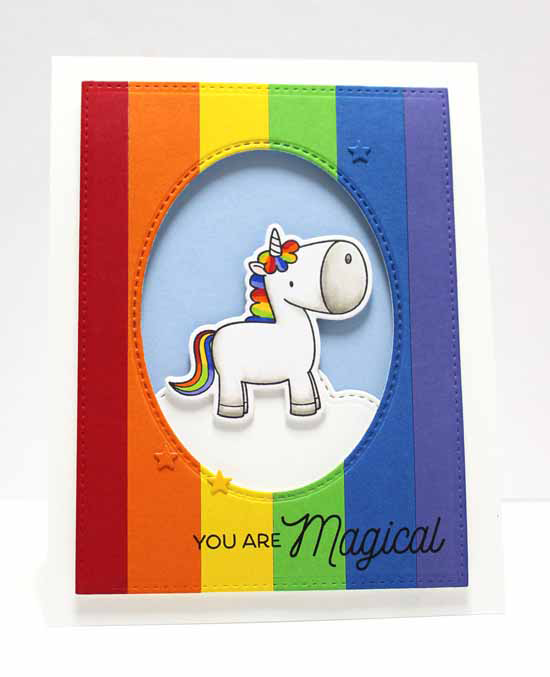 Jody goes crazy colorful and bold with the Magical Unicorns stamp set and End of the Rainbow Die-namics. Her vibrant background is such a CHEERY design! Magical, indeed. 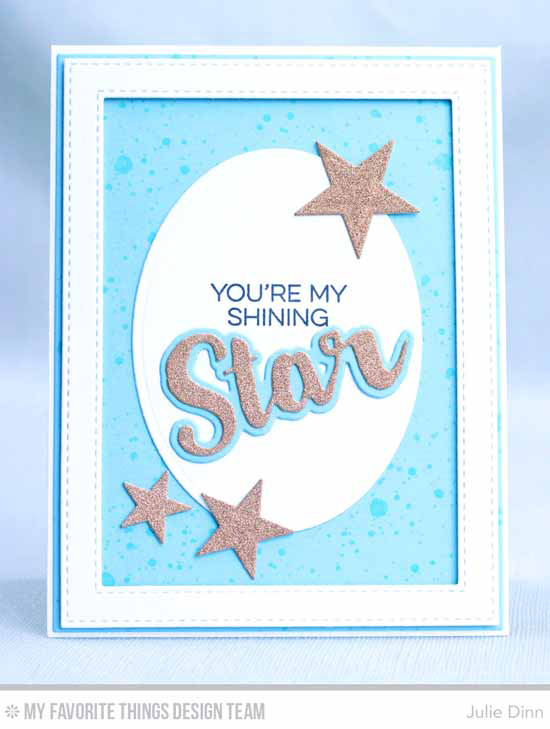 Karin's card is super sweet with a scalloped oval and tiny stars framing the New York Skyline. 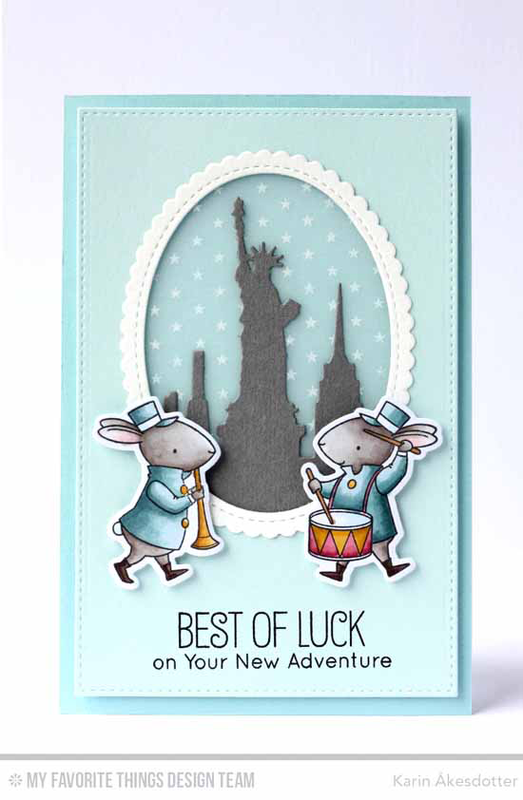 The band bunnies from the Strike up the Band stamp set and Die-namics flank the oval for a delightful design. 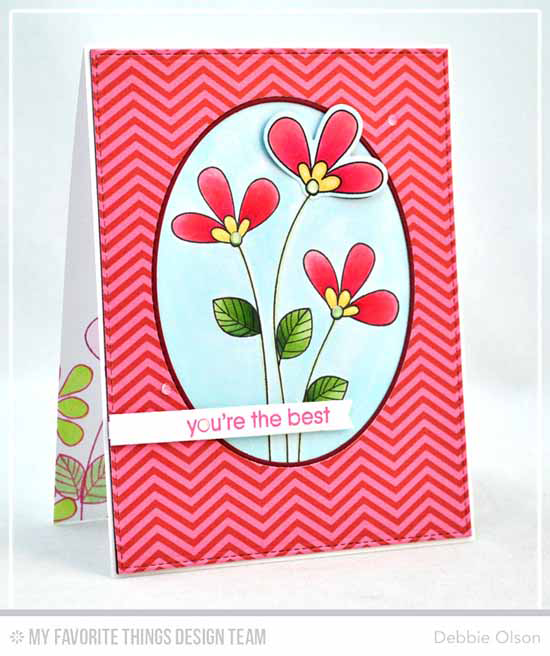 Debbie uses the oval of the sketch as a spot to feature some gorgeous blooms from the Build-able Bouquet stamp set. I love how the patterned paper frames everything. And did you see that she added some stampy goodness to the inside of the card, too? So pretty. 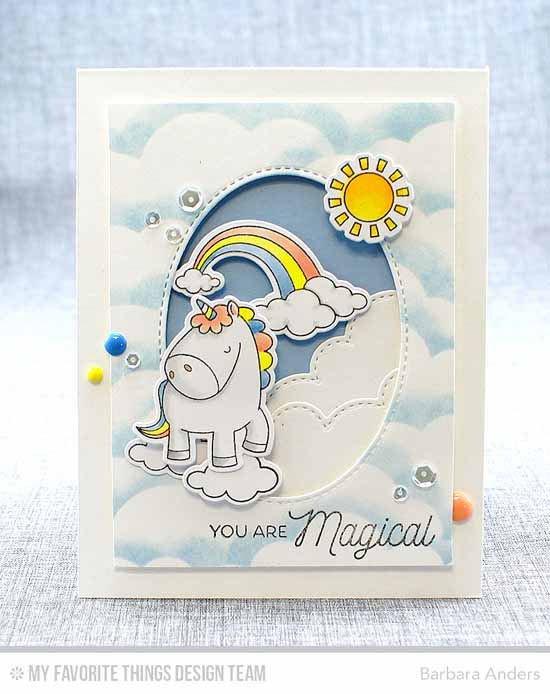 Using the Stitched Cloud Edges Die-namics, Barbara creates a gorgeous and realistic cloudy sky to frame the adorable unicorn and rainbow from the Magical Unicorns stamp set and Die-namics. I love all of her extra touches with the enamel dots and sequins to add to the enchanting nature of her design. I love how Julie's oval isn't cut from the card front, but sits on top of the card base for a different take on this sketch. 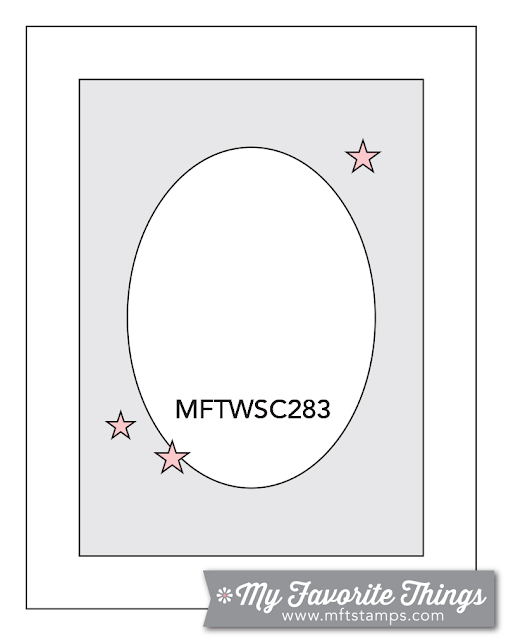 The sparkly stars anchor the oval, and the frame perfectly completes her encouraging greeting. Congratulations, ElizStewart! You are the randomly selected winner of last week’s sketch challenge. You can view all the entries for last week’s challenge HERE. You have until Tuesday, June 7th, at noon EDT to add your link and be eligible for the prize of up to $20 in MFT Cash to be spent in the MFT boutique. Winners are chosen at random, so everyone has a chance! The weekly prize is a $15 Gift Voucher to My Favorite Things, but if you use MFT stamps and/or dies in your project, you’ll receive an extra $5. Thank you, thank you, thank you! I feel so very lucky to be drawn and have spree money! Where do you post the winner? Do you notify them by email too? Winners are linked in each blog post and are notified by email.